A reference question at the WHOI Data Library and Archives led to the discovery of a previously unidentified photograph of Gregorio Fuentes, the first mate of Ernest Hemingway's yacht, El Pilar, and the person many consider to be the inspiration for Santiago, the title character in Hemingway's The Old Man and the Sea. In 1938, the Atlantis, with chief scientist William Schroeder, took a three month cruise (cruise 74) to collect fish in the waters around Cuba. The cruise also included University of Havana biologist Luis Howell-Rivero who, in addition to the regular crew of the Atlantis, brought several of his own assistants on board. One of those assistants was Fuentes, who worked at the time as a fisherman in Cojimar, Cuba and would have had knowledge about good areas to collect fish. 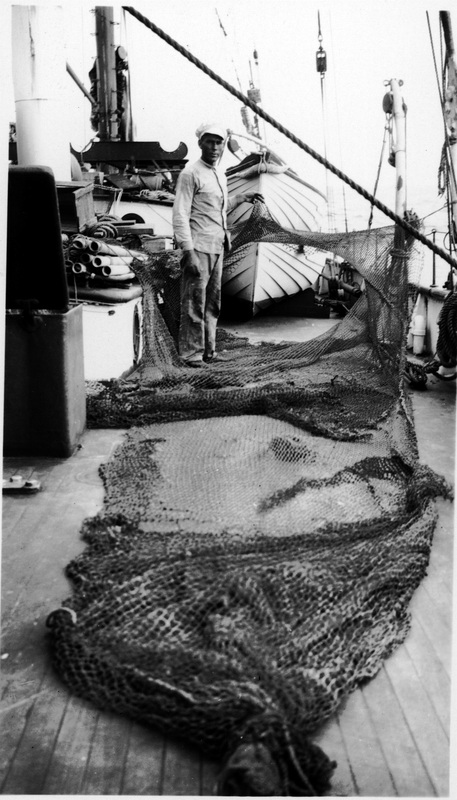 Besides the picture, showing Fuentes on the deck of the Atlantis with a fishing net stretched out in the foreground, other evidence of Fuentes' time on the Atlantis was found in a mention in the journal of Atlantis first mate, Thomas Kelley, and in a letter from the Master of the Atlantis, Fred. S. McMurray to Henry Bigelow, "Have had a lot of torn nets, lost completely one or two, but our fisherman Fuentes is very capable in mending." Photo courtesy of WHOI Archives. Copyright © Woods Hole Oceanographic Institution.